Review: Premiere Home Theatre Surroundings Sequel Recliner One of the best pieces of advice I can give people looking for a great home theater experience is to really consider what they will be planting their rear ends into—think about investing in home theater seating. Whenit comes to seating, we’ve found that the Premiere Home Theatre Surroundings line practically sells itself. 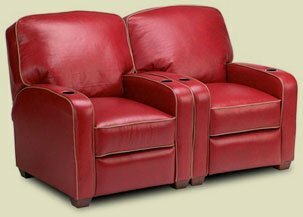 They’ve been specializing in home-theater-intended seating for more than four years now, and have a broad selection of styles with enough fabrics and leathers to suit just about any interior or taste. Their latest model, the Sequel (starting at $1,995), maintains tradition and establishes the standard, as far as we’re concerned. 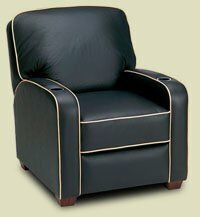 The Sequel is a theater recliner seat with several exclusive features that anyone who values comfort and convenience will immediately appreciate. For instance, a clever in-arm storage bin is perfect for storing remotes, gaming controls and programming guides. This compartment is hinged at the back, padded on top and covered in matching material. A swiveling, real burl-walnut food tray makes an ideal place for setting your popcorn or favorite movie snacks. Heck, you could eat whole meals on this baby. The great thing about this line of seating is that it doesn’t require extensive installation time. The seats simply push together, side by side, instead of having to be bolted together like other brands. One tip when buying theater seating is to know the exact room measurements, if possible. This will help determine how many chairs you can fit in a row, whether you’ll need to build a riser for a second or third row, and whether you’ll need chair arms that are straight or angled. If you like the idea of snuggling during a movie, the Sequel, as well as other Premiere models, can be configured into love seats and even sofas. All Premiere dealers are trained to work closely with you and your interior decorator to handle all the details and help you get the most enjoyment possible from your home theater. Gary Shibetta is executive vice president of Georgia Home Theater. He is a member of HTSA and PARA. Email him at gary@georgiahometheater.com. Each year, Inside Track surveys hundreds of the finest custom specialty home entertainment dealers in the U.S., to compile an overall Dealer Satisfaction Report, which they publish in their monthly newsletter read by the consumer electronics industry. When it comes to reporting, this “no-holds-barred” industry publication is known for their brutal honesty! Furthermore, Premiere HTS finished with an OVERALL grade of 3.32/B+, which is even higher than last year’s winner! Why have dealers voted Premiere HTS as the Number One Home Theater Seating Vendor? Because, in addition to having the best products and sales/merchandising/customer support programs possible, the staff at Premiere HTS are experienced home theater veterans that understand YOUR business. Read the articles that have been published recently in the most highly-respected home theater trade publications such as CE Pro, Residential Systems, and Custom Retailer magazines, to name a few. Premiere HTS educates dealers on how to sell home theater seating and become a total home theater solutions provider — earning Premiere HTS the well-deserved reputation as the preferred choice in the home theater-seating category.